You are here: Home / Recipes / 12 Healthy Nut Recipes You Can’t Resist! If I had to list 10 foods everyone should eat regularly, nuts and seeds would be up in there in the top 5. Today I bring some facts about why you should eat nuts, plus 12 healthy nut recipes! Why should you be nutty about nuts? Healthy fats: Nuts contain monounsaturated fats that are good for health in general and heart health in particular. But walnuts contain omega-3 fats–super fats for your heart, eyes and brain. Good source of vitamin E: This antioxidant is hard to get and many people don’t get enough. Almonds are a good source as are sunflower seeds. Good for your gut: Really? Yes, technically and figuratively. In a new study, almonds have been shown to help with belly fat loss. Research suggests that the fiber in almonds could act as a prebiotic, helping maintain healthy gut bacteria. OK ENOUGH SCIENCE, BRING ON Those healthy nut RECIPES! First for some savory recipes. 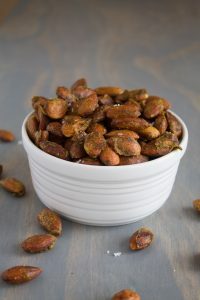 I love the spicy flavor of arugula in a salad (especially with goat cheese:), so this recipe for Arugula Pesto Roasted Almonds from Kara at The Foodie Dietitian caught my eye. Make some pesto for your pasta and toss the rest with almonds for a healthy snack! Trying to eat more veggies? Check. Tire of the same old? Check. 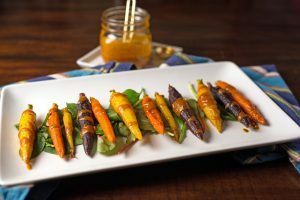 Enter these Roasted Rainbow Carrots with Spicy Curry Almond Sauce from Gabriella RDN at macrobalanced.com. Curry gives it a kick but also provides you with an inflammation-fighting dose of turmeric and curcumin! You could use the technique and sauce on just about any veggie that is good roasted! Now, have your cake and eat it too! 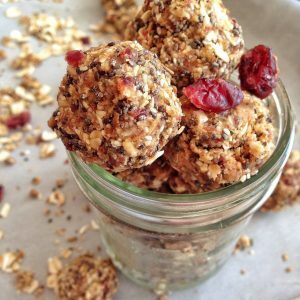 These dietitian-developed healthy nut recipes will satisfy your sweet tooth! I have a weakness for Peanut Butter Cups. I don’t have them stockpiled in my pantry at home, but when they’re in the candy jar at work, I’m the first to grab and go! 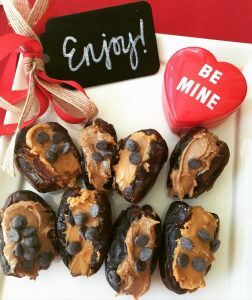 So imagine my happiness when I saw this recipe for Chocolate Peanut Butter Cups by Nutrition by Nazima that not only had peanut butter but also chick peas! How genius–chick peas have a bit of texture, which simulate chunky peanut butter. Ever want just a bite of something that will give you energy plus lots of flavor? And that you can serve to the kids without guilt? 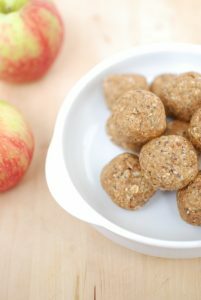 Check out these No Bake Apple Peanut Butter Energy Bites from Chrissy RD at Snacking in Sneakers. A bit of crunch thanks to chia seeds, some sweetness from apple and dates and oats for stick-to-your ribs feeling. To me this says breakfast-on-the-run or after-the-run snack. 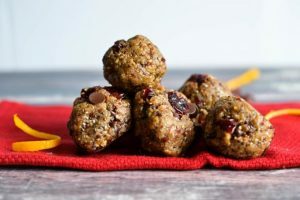 Speaking of energy bites, Katie RD from One Hungry Bunny has created a similar energy bite, Cranberry and Orange Energy Bites. If you’ve got a hankering for chocolate, you can throw in the optional chocolate chips. Choose dark and call it good! I’ve got a weakness for cookies. When it’s Girl Scout Cookie season, I stock up on Do-Si-Do’s and eat about 6 a week, give or take. 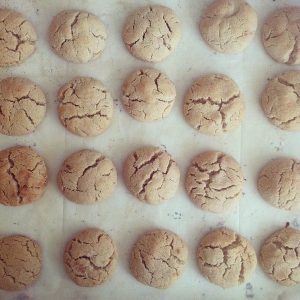 But I’m always looking for that perfect, yet a little healthier than usual, peanut butter cookie recipe and I think I’ve found it! Kim RD over at Nutrition Pro Consulting had me with the picture of her Peanut Butter, Flax and Coconut Cookies. Being kind of a peanut butter cookie eating expert, I can tell by looking that those are slightly crispy on the outside yet soft on the inside. Double Yum. Do you see a trend here? Energy bites. With peanut butter. If you’re wondering why I’m so nutty about peanut butter, check out my post here, where I describe all the reasons you too should be eating peanut butter! So Jen Haugen, besides loving to create things with peanut butter, also is a Pampered Chef fan like me. In fact, in the picture below, there is a Pampered Chef measuring cup and small scoop that makes this recipe for Peanut Butter Energy Bites even easier to prepare! And here’s another one! 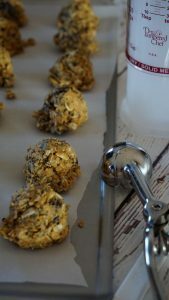 No Bake Peanut Butter Trail Mix Bites from Sarah RD at Bucket List Tummy. They have all the seeds du jour–chia, flax and chia, which provide not only crunch but also omega-3 and fiber! And cherries? They are super rich with the antioxidant anthocyanin, which also has anti-inflammatory properties. Finally, a tasty little treat you can make in about 1 minute from Shannon RD, fellow Texan at Lone Star Nutrition. Her blog, Kiss in the Kitchen, features no-fuss recipes that are good for you! You can see by the pic of these Stuffed Medjool Dates, there are just 3 ingredients–a perfect surprise for your honey. Got leftover bananas to use up? 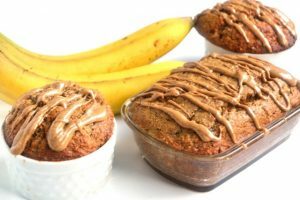 No problem with this Almond Cashew Butter Banana Bread recipe from Amanda RD at The Nutritionist Reviews. Made with whole wheat flour and olive oil, they are drizzled with Bestie Almond and Cashew Butter. 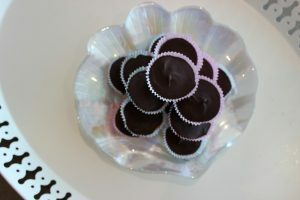 I love do it yourself desserts like these Almond Granola Cups from Tracee RD at Triad to Wellness. So here is how it works. 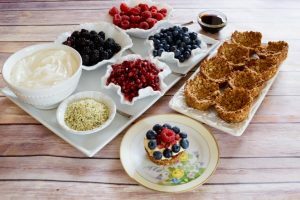 You set out these beautifully crunchy granola cups with a variety of fillings such as Greek yogurt, Whipped Greek Yogurt or some other creamy filling. Your guests fill as desired and then top with a variety of fruit and berries. 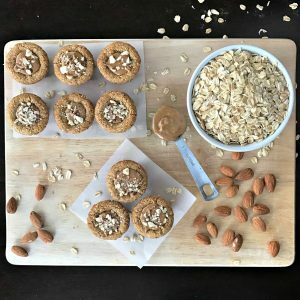 If you like the idea of fill-up-your-own cups but are looking for something a little lower in carbs, check out these Almond Granola Cups from Brittany at Your Choice Nutrition. They are vegan and gluten-free and also only have 9 grams of carb per mini cup. These recipes look delicious! Will definitely be trying some of these to get more nuts in my diet! I usually stick to nut butter and adding nuts to salads, so this is great to switch it up! I hear you–I’m the same. Now we have lots to try! Yes, I love the idea of a spicy almond sauce over roasted veggies! I love the variety of recipes you chose. Those stuffed dates looks ah-mazing! Don’t they? And SO simple!! Wow, what a great list! Thanks! I’m loving all these recipes, Bridget!! Thanks so much for including me in this delicious and beautiful roundup! Thank you for sharing! Love that your recipe is so simple!